You may recall that coucou has appeared on this blog before. Back then, this traditional Trini (and Bajan) cornmeal dish appeared as part of a Sunday lunch with red beans and stew chicken. Coucou is generally regarded as a bit labour intensive, similar to polenta, requiring one to stir cornmeal into hot liquid etc constantly to avoid lumps and get the nice smooth silk texture. I flouted tradition, however, by following Cynthia’s recipe for MICROWAVED coucou! It came out quite well and the Sunday lunch was not disadvantaged. This time around the coucou formed part of a lovely pie layered on top of a yummy minced beef mixture. Growing up, Mom used to make this and called it a tamale pie, because it was like a baked tamale (or in the case of T&T, a baked pastelle pie!) I decided to call it a coucou pie for this recipe because I think my treatment of the cornmeal was more along the lines of making a coucou. 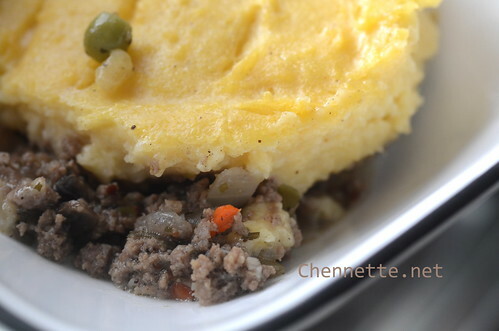 And if you search for tamale pies online, you find strange Southern American recipes with a sweet cornbread topping. Not what I wanted. 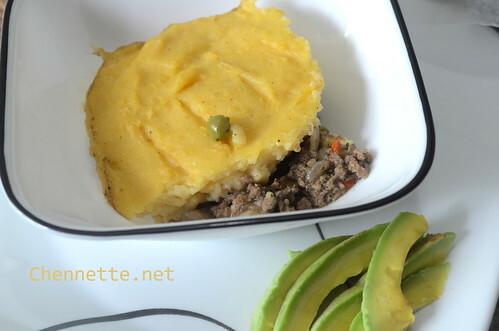 We (Lilandra and I) also recalled a really good cottage pie I had made some months ago, with a lovely moist beef and wanted to mimic that, but without the potato. We made this pie for Eid ul Fitr Day One*. Our meals that day were gluten-free as my mother is avoiding flour for medical reasons. Only my father, who apparently does not like the texture of coucou, didn’t enjoy this dish…but I swear we did not know this beforehand! The coucou mixture uses a basic ratio of 1 part cornmeal to 3 parts liquid – the liquid in this case was water, milk and beef broth. I didn’t use coconut milk because it wasn’t really supposed to be coucou. I added the beef broth since the filling was beef, and also added good amounts of cheddar and aged cheddar – MMMM. Seriously good. The beef was seasoned the usual way but I didn’t use any tomatoes, or tomato products – no ketchup, tomato paste/sauce etc – as Mom is also bothered by tomatoes and their relatives (such as potatoes and eggplant). This recipe would work really well with tomatoes in some form but honestly, we did not miss it. 1. Put a large, wide, heavy-bottomed pan and heat till drops of water sizzle on the surface. 2. Add minced beef to pan and stir to break up lumps and cook the meat. Drain some of the fat. 3. Add onions, peppers and carrots (if using). Stir into beef, cook until onions are just translucent and carrots still al dente (I like the flavour from sweet peppers but not the texture so I tend to cook them dead, you can add the peppers later if you want them crisper). 4. Add mushrooms, cook until mushrooms have shrunk and got some brown colour. 5. Add peas, green olives, tomatoes (or paste), spices, minced garlic and beef cube (dissolved into 2 cups warm water). Mix well. 6. Let come to a boil and taste for salt etc. Adjust seasoning and lower heat and let simmer until the liquid has reduced somewhat but you still want it to be like a thin chilli, otherwise it can be very dry after baking – remember some liquid will absorb into the cornmeal top layer. While the beef is simmering you can make the coucou! 2. Slowly pour the cornmeal into the boiling liquid, whisking constantly. When all cornmeal is added, beat with a strong wooden spoon until it seems smooth but still fairly liquidy. 3. Add the shredded cheese, continue stirring or beating until the cheese is fully incorporated. Mixture will look a bit shiny and should be like thick porridge or batter. You don’t want it to dry out as you are baking it so you don’t have to turn it into firm coucou. Taste for seasoning, adjust if necessary (between the cheddar and the beef bouillon I don’t think I added salt). 4. Spoon out the coucou immediately onto the beef – drop small potspoonfuls ontop of the beef. Gently smooth the top of the coucou with the back of a spoon or spatula (dip in hot water if the coucou starts to firm up or set during this process. 5. Bake in pre-heated oven until top has developed a deep golden colour (cornmeal like this will not brown easily unless you dot with butter or cheese). Spoon out servings into bowls if eating right away. If you let it cool a bit you might be able to slice it, but who can wait. This goes really really well with some zaboca (avocado) on the side! Note: For my first time with the endless-stirring of the coucou, this was not at all endless. It mixed up smooth and lump-free in less time than I expected. It does require the elbow grease at the beginning (maybe because I was actually making double this recipe – FOUR cups of cornmeal…) but after that it was straigthforward. Maybe it’s the Promasa…pastelle makers swear by it! Maybe it was also the fact that I wasn’t cooking it as long because I didn’t want it to firm up too much. This entry was written by Chennette and posted on August 11, 2014 at 8:36 pm and filed under Caribbean, Eid ul Fitr, food, photos, recipes, Trinidad and Tobago. Bookmark the permalink. Follow any comments here with the RSS feed for this post. Post a comment or leave a trackback: Trackback URL. Hi Dunori. Pastelles are from our Venezuelan neighbours, where they call them hallacas. There are leaf/husk wrapped corn dough foods throughout the Americas. Mexicans seem to use corn husks, while down South here we use banana leaves.